I know I'm in the minority (especially, it seems, among women) in that I like caramel much more than chocolate. Making me even more of a freak is the fact that I'll also take white chocolate over its darker cousin any day. Good thing it's never bothered me to be different. Have you come across this Molten Deep Dish Chocolate Cookie Mix from Krusteaz? If not, you should absolutely seek it out. They have other varieties too, including ones that use classic and sugar cookies. Those are filled with chocolate, though, which is dandy if that's your preference. The ones I got were filled with caramel, and they're like a brownie-Rolo® hybrid that you thought only existed in your dreams. Because nothing good comes of lies, I have to tell you that these are a bear to make, at least the way I did it. In retrospect, letting the dough chill for an hour of so probably would've made a world of difference. As it was, I didn't chill it, and it plastered itself to the gloves I wisely opted to wear. Trying not to get chocolate cookie dough on everything I got near proved to be a real challenge, and I ended up needed some assistance to get the caramel packet opened. So, long story short, even though the directions don't specify chilling the dough before you attempt to roll it into balls and then shape those into disks, DO IT. Your kitchen will thank you. 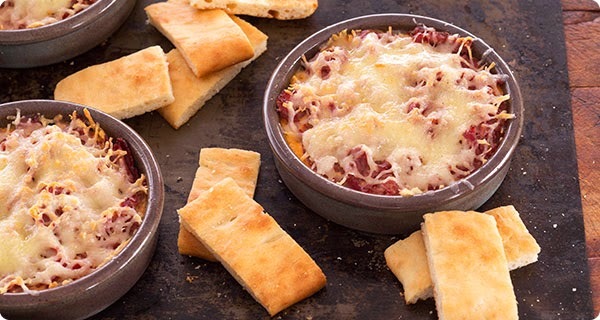 *Tasty Turnovers, Dips & More: Before the turnovers start on the field, party hosts can whet fans’ appetites with their own Game Day Cheeseburger Turnovers or Fiery Bruschetta Bites. Both are fan favorites. Krusteaz’s White Bean & Parsley, Hot Reuben or Hot Caesar dips are best served with their warm flatbreads. *Forget Pizza Delivery. Make Flatbreads! While pizza makers huddle in preparation of the year’s biggest pizza delivery day, fans can create delicious flatbread pizzas right at home. Recipes like Krusteaz’s Grilled Flatbread Pepperoni Pizza and light recipes like the Little Guilt Grilled Flatbread and Thai Chicken Flatbread with Homemade Light Peanut Sauce showcase simple ingredients that will be winners with fans of all ages. *Savory Main Spread: For heartier fare, fans can kick off the main meal with Krusteaz’s Classic Cuban Focaccia Sandwiches, Family-Friendly Flatbread Tacos or Meatball Calzones. Enjoy the game and all the good stuff that comes with it! Heat oven to 350 degrees F. If necessary, soften cold butter in microwave for 7-10 seconds. Spray a standard muffin pan with cooking spray or line it with muffin cups. Stir together egg, butter, and cookie mix until dough forms, hand kneading if necessary. **At this point, I strongly urge you to refrigerate the dough for an hour or so! Scoop 24 equal size dough balls (approximately 1 tablespoon each). Place a flattened dough ball into each muffin cup. Cut quarter inch corner of caramel filling pouch (enclosed); squeeze approximately 1-1/2 teaspoons filling on top of dough in each cup. Flatten remaining 12 dough balls and place over filling in each cup; press lightly to seal edges. Bake for 17-20 minutes, being careful not to overbake. If you can smell them, that means some of the good stuff is escaping! Cool cookies in pan about 5 minutes before removing. Caution: Filling will be HOT (and delicious)! Sounds delightful - even though I'm not much of a chocolate person either! Caramel and chocolate..a match made in heaven! I disagree about white chocolate, but I definitely prefer caramel (and toffee, and butterscotch) to chocolate. Wow! I am drooling here....that looks amazing, Grace! I only eat real chocolate, never chocolate foods like cake or brownies. But I adore caramel above all else! Chocolate covered caramel candies are like a slice of heaven to me. But I could try this tomorrow, when some of my hungry horde are descending for the weekend, along with some of your other great looking ideas! These look awesome and I forgive you for liking white chocolate over dark. You can send all the dark my way. Thanks for sharing, Grace and btw, there isn't a freaky bone in that body of yours I'm sure!!! My caramel loving son would LOVE these molten cakes. So would I! woof! Rolo cake got my attention, that looks delicious... but if you had problems making it, I'm scared! You're not alone...give me lots of caramel with my chocolate! These look gooey and sticky...will take your advice on refrigerating. Which actually is good advice with a lot of cookie and bar baking. If my husband see's these cookies, he will be sending me to town asap! I do love caramel, so I am trying to figure out why I don't have it around more often? Will have to work on that! 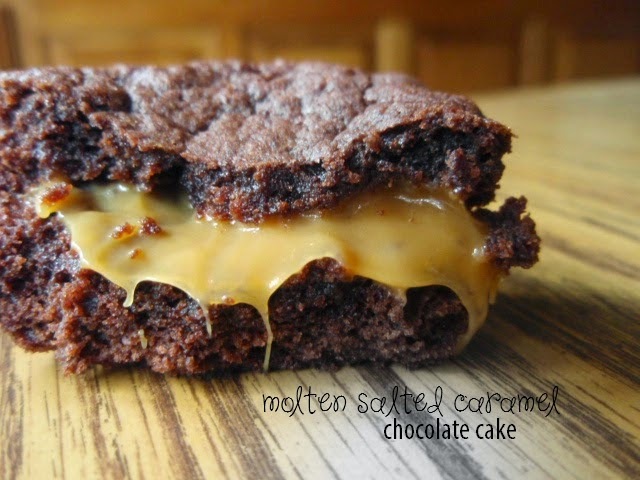 Caramel oozing our of chocolate is very drool-worthy..... I really want these!